The Nutation Drive is a mechanically positive, gearless power transmission that offers high single-stage speed ratios at high efficiencies. A nutating member carries camrollers on its periphery and causes differential rotation between the three major components of the drive: stator, nutator, and rotor. Correctly designed cams on the stator and rotor assure a low-noise engagement and mathematically pure rolling contact between camrollers and cams. The drive's characteristics, include compactness, high speed ratio, and efficiency. Its unique design guarantees rolling con­tact between the power-transmitting members and even distri­bution of the load among a large number of these members. Both factors contribute to the drive's inherent low noise level and long, maintenance-free life. The drive has a small number of moving parts; furthermore, commercial grease and solid lubrication provide adequate lubrication for many applications. Basic components. 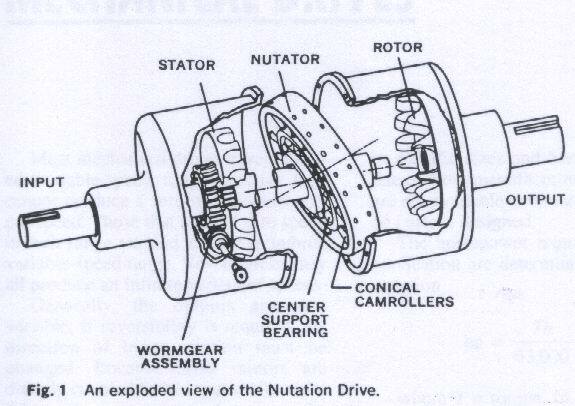 The three basic components of the Nutation Drive are the stator, nutator, and rotor, as shown in Fig. 1. The nutator carries radially mounted conical camrollers that engage between cams on the rotor and stator. Cam surfaces and camrollers have a common vanishing pointthe center of the nutator. Therefore, line-contact rolling is assured between the rollers and the cams. Nutation is imparted to the nutator through the center sup­port bearing by the fixed angle of its mounting on the input shaft. One rotation of the input shaft causes one complete nuta­tion of the nutator. Each nutation cycle advances the rotor by an angle equivalent to the angular spacing of the rotor cams. During nutation the nutator is held from rotating by the stator, which transmits the reaction forces to the housing.